What is the Developer Pack? Describes what the Developer Pack includes and how to enable it on your Fulcrum plan. 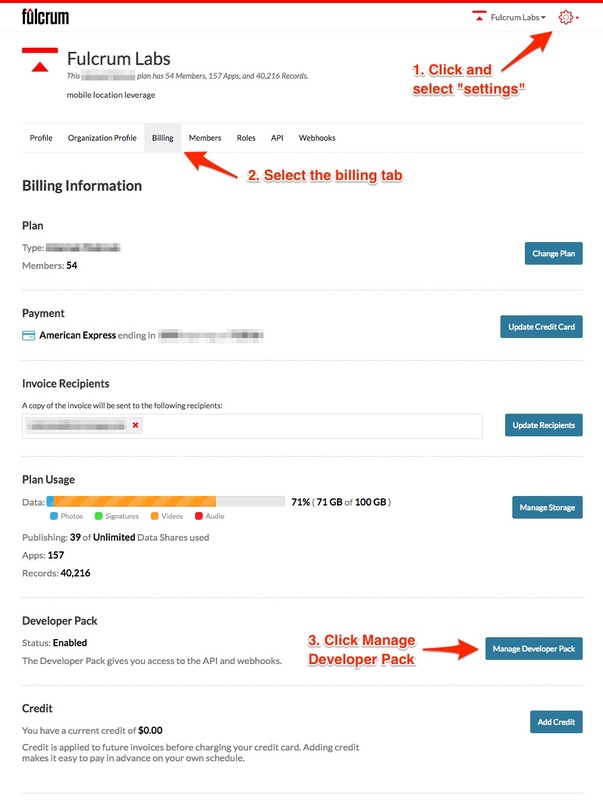 Any plan can enable the Developer Pack from the billing tab on the settings page of the Fulcrum web app. The Developer Pack grants you access to the REST API, the Query API, and Webhooks. Click on the red gear icon and select settings to access the settings page. Once on the settings page, click the billing tab. On the billing tab, click the Manage Developer Pack option. This will take you to a page where you can enable and disable the Developer Pack. You can view the REST API introduction documentation here. Clicking on the API tab on the linked page will reveal a drop-down menu with additional pages on specific endpoints, changelogs, and field types. The Query API provides read-only access to interact with your Fulcrum tables and data (records, repeatables, choice lists, members, media, etc.). This endpoint supports most standard PostgreSQL database functions, including many advanced spatial types supported by the PostGIS extension. The API enables real-time data analytics for integrating Fulcrum with a variety of Business Intelligence (BI) services and platforms, as well as permits more programmatic scripting for custom data exports. You can view the Query API introduction documentation here. Clicking the Query tab on the linked page will reveal a drop-down menu with additional pages for references and examples. The concept is straight-forward. When your data changes on the Fulcrum servers, we push a notification to your server to alert you. This allows you to write software to do something with that data. More completely, changes to the data in your organization create events. Events contain information about that changed data. You register the URL of a server at which you’d like to be notified of these events. The events are then pushed to the webhook URL in an HTTP POST request. Your server receives and can then process the event and data. You can view the Webhook developer page here. Additional help articles and guides for webhooks can be found here. If you need assistance with getting the most out of the Developer Pack or would like us to build something that leverages the Developer Pack our professional services team can be leveraged.